Homogenized, non-homogenized, pasteurized, ultra-pasteurized, conventional, whole, low fat, fat free. Goodness there are so many options when it comes to Milk. Upon researching the various choices, our family has chosen to stick to the least processed version: Raw Organic Grass-Fed Non Homogenized Cow’s Milk. What a mouthful. Want to know why? Read on and I will tell you why I have found that less processed=healthier. Below I am going to breakdown the various processing techniques of each variation of cow’s milk as well as the different options in fat content. Homogenized: The purpose of homogenization is to mechanically break down fat molecules in milk so they do not separate. Without homogenization, fat molecules in milk will rise to the top and form a layer of cream. Homogenizing milk breaks down the fat molecules to such a small size that they remain suspended in the milk evenly instead of rising. This is desirable for farmers so they are able to control the fat content of milk, whereby producing whole, low-fat and fat free milk. Also, this allows farmers to mix milk batches easily since the fat is evenly distributed by way of homogenization. Homogenization also leads to a longer shelf life than “Cream Top” milk. There have been questions concerning this process, in that these fat molecules are broken down to a size whereby they can be absorbed much differently than in their natural state, leading to heart disease for one. Homogenization is another step in the commercialization of milk and one step away from milk in its most natural state. All benefits go to the PRODUCER not the CONSUMER. Non-Homogenized: Milk is allowed to separate naturally, where the cream rises to the top. The butterfat within it contains short-and-medium-chain fatty acids which benefit the immune system, as well as conjugated linoleic acid (CLA), a potent antioxidant, among other valuable nutrients. These larger fat molecules are not as easily absorbed, and do not enter the blood stream unlike their homogenized counterparts. This is more natural than homogenized, therefore preferred. Pasteurized: Most common is heating milk up to at least 161.6 degrees Fahrenheit for 15 seconds, which is known as High Temperature-Short Time pasteurization, or flash pasteurization. Pasteurization kills both good and bad bacteria. This type of pasteurization leaves many of the valuable enzymes, vitamins, and beneficial bacteria diminished and renders the product more or less “dead”. Eradication of these nutritional elements, including the bacteria, actually promotes the bad bacteria growth with no beneficial bacteria left to fight and keep the milk “safe”. Not ideal, but when dealing with large quantities of milk from different herds, it is necessary in order to keep the product sterile. But do we want our milk to be sterile? Not me. Ultra-Pasteurized: Ultra-Heat Treatment (UHT), where milk is heated to 280 degrees Fahrenheit for a minimum of two seconds. This processing results in a much longer shelf life. This treatment changes the taste and texture of the milk. The high heat creates a cooked flavor, along with once again scorching the beneficial bacteria and nutrients. The process also affects whey proteins that contribute to the texture of dairy. In order to make up for this denaturing of the milk, congealing agents like guar gum and carrageenan are added to ultra-pasteurized dairy to get back to the original consistency. Seems like another convenience for dairy farmers that really isn’t beneficial to us consumers. Conventional (Non-Organic): Cows can be kept indoor, with no minimum amount of space, fed whatever the farmer desires, pumped full of rGBH and antibiotics to cure the ailments that result. These cows are fed genetically modified soy and corn feed, which is the cheapest feed one can buy these days. These cows do not have to be treated humanely, are not required to have access to outdoor pasture, and are not guaranteed humane living conditions. Sounds tasty, no? These type of dairy farms are a worst case scenario. Organic: Organic milk comes from cows who have been fed only organic feed, graze on grass which accounts for at least 30% of their diet, must have access to outdoor pasture year round, and are not given rBGH (Recombinant Bovine Growth Hormone). This hormone unnaturally increases production of milk in cows, whereby also causing illnesses such as mastitis. These illnesses need to then be treated with antibiotics, so it is a vicious cycle. However, don’t be fooled. Organic milk is still subject to homogenization and pasteurization, therefore killing the beneficial bacteria and nutrients that are the reason we drink milk! Organic is not enough! Raw: The healthy alternative to pasteurized, homogenized, conventional, low fat milk is raw milk, which is an outstanding source of nutrients including beneficial bacteria such as lactobacillus acidophilus, vitamins and enzymes, and it is one of the best sources of calcium you can consume. This milk is straight from the cow, so to speak, and retains the highest nutritional content over all of the alternatives. There are risks associated with drinking raw, however no more than eating rare beef or sushi. The benefits far outweigh the risks. Low Fat (2%) and Skim: This means the cream has been skimmed off the top of the milk then later added back in to reach a desired percentage of fat. This is done using metering pumps which determine the amounts of skim milk, cream, and condensed skim milk that are recombined and pumped into the pasteurizer. (California state law requires dairies to add “nonfat milk solids” back into 1 percent and 2 percent milk to make them more nutritious.) So even California knows that the “nonfat milk solids” aka cream, contains a significant amount of the nutrition in milk. This journey to raw milk took a little over a year. 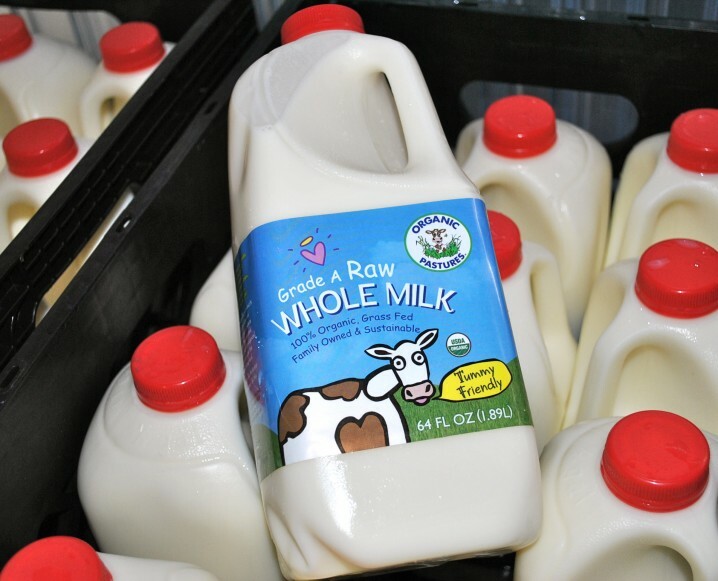 It began with conventional whole milk, then we switched to organic whole milk, then grass fed organic non homogenized whole milk, then finally we found raw milk and haven’t regretted it one second. I hope this information helps you understand exactly what all of these big words mean, as well as question exactly what you are putting in your body and the bodies of your children and family. Sometimes not knowing is easier, but it definitely isn’t healthier. I encourage you to do research in to the food items you purchase. Things cannot always be taken at face value, unfortunately.